A house silently engulfed in flames in the middle of the night — that was the lingering, last shot of “Better Call Saul” season three. Now, over a year later, viewers finally get to see the aftermath of the incident, which has left the show’s main character, James “Jimmy” McGill (Bob Odenkirk), in utter disarray, despite his best attempts to mask it. As a prequel series to “Breaking Bad,” “Better Call Saul” follows Jimmy’s evolution from a struggling attorney into his much darker, dirtier “Breaking Bad” persona, Saul Goodman. What may have been an easy cash grab after the success of “Breaking Bad” has actually become an entirely different series. While “Breaking Bad” is flashier and grittier, “Better Call Saul” is more than content to slow down and tell its own story of a well-meaning lawyer who ends up cutting one too many corners. In season four, Jimmy’s evolution into Saul seems more inevitable than ever before. Jimmy’s inner turmoil, especially in regards to his search for a job and his dysfunctional relationship with his brother, Chuck (Michael McKean), manifests itself in his morally dubious actions throughout the season. His schemes and lies, whether for good or for bad, will undoubtedly reap repercussions for him and his fragile relationship with his partner and fellow lawyer, Kim Wexler (Rhea Seehorn). This season, Kim quickly climbs the ladder to success — she joins a new law firm, continues work with Mesa Verde Bank and Trust, and even tackles pro bono cases. Meanwhile, Jimmy further strays from being the “good guy” — his law license is under suspension, he sells drop-phones to criminals, and he isn’t afraid to steal, con, and threaten others to get what he wants. Odenkirk and Seehorn go on to execute with Emmy nomination-worthy performances the ups and downs of Kim’s and Jimmy’s relationship. From the drastic lengths they go to support each other to the little remarks that further divide them, the riveting dynamic between Kim and Jimmy burns slowly but deeply into the emotional core of the show. 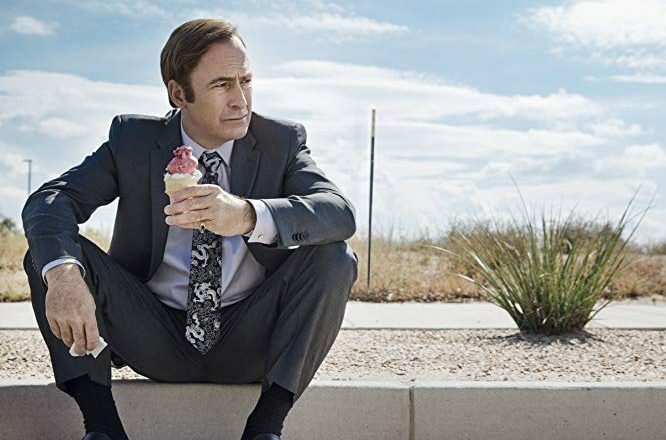 Following “Better Call Saul” is like watching a runaway train and waiting for the inevitable wreck as this season hurtles the show closer to the timeline of “Breaking Bad” than ever. The anticipation for the “end,” namely the formation of Saul Goodman, is a concept both exciting and dreadful. “His formation affects the rest of the characters; his appearance in “Breaking Bad” comes with the disappearance of many current “Better Call Saul” characters, but don’t assume that “Better Call Saul” is simply a side addition to a pop culture phenomenon. With jaw-dropping twists, gut-wrenching cliffhangers, and a tear-inducing finale, season four clearly proves the show’s capability of garnering its own, rightfully-earned acclaim as one of the most intriguing character studies on television.